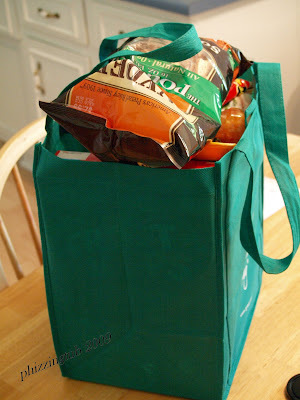 The Phizzing Tub...: Can you make my green grocery bag any heavier? You know I enjoy using my green bags from the grocery store. Fewer trips with bags and they hold so much more food. The only downfall to using them I have found is that the cashiers simply over pack them. I could get a really good work out using two of them at a time, my only fear would be that the handles would rip off and with my luck that would end up in total grocery disaster. Does this only happen to me or are others out there experiencing the same arm building experience? A drive thru at a festival ? !